"Communicating At The Hospital In Japanese" is designed for English speakers who need to communicate with Japanese speaking doctors, nurses & health care staff. 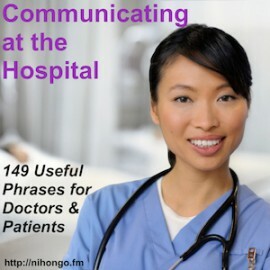 Studying with "Communicating At The Hospital In Japanese" will increase confidence, vocabulary, rhythm and correct pronuinciation needed when speaking with hospital staff about health issues and help discuss diagnosis & treatment. The complete audio course consists of 5 sections with a total of 11 audio tracks and a total of 149 sentences.